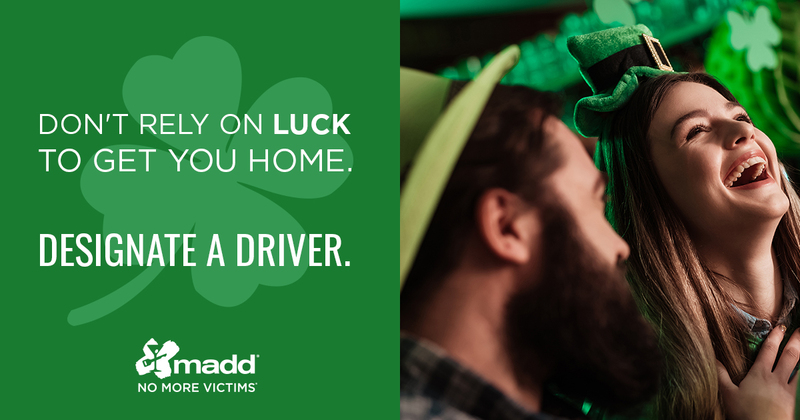 Don’t count on luck to get you home safely. If you drink, don’t drive. If you drive, don’t drink. Mothers Against Drunk Driving® (MADD) is urging everyone to keep their St. Patrick’s Day festivities safe by planning ahead for a non-drinking driver before leaving home. With St. Patrick’s Day falling on a Sunday this year, more people may take advantage of the opportunity to celebrate throughout the day with parties and special events at bars. Nationwide, drunk driving killed 59 people in 2017 — 37 percent of all traffic fatalities — during the St. Patrick's Day holiday period from Friday, March 17 to 5:59 a.m. on Saturday, March 18. From 2013 to 2017 during the St. Patrick’s Day holiday period (6 p.m. March 16 to 5:59 a.m. March 18), 234 people died in drunk driving crashes. Drunk driving is the leading killer on our roads and claims the lives of almost 11,000 people in the United States each year. Every single one of those deaths is preventable. In addition, driving while impaired by other drugs — legal and illegal — causes devastating and preventable tragedies. With all the options today — rideshare apps, such as Uber, taxis, public transportation or family and friends who have not consumed alcohol — there’s no excuse to drive while impaired. Founded in 1980 by a mother whose daughter was killed by a drunk driver, Mothers Against Drunk Driving® (MADD) is the nation’s largest nonprofit working to end drunk driving, help fight drugged driving, support the victims of these violent crimes and prevent underage drinking. MADD has helped to save nearly 380,000 lives, reduce drunk driving deaths by more than 50 percent and promote designating a non-drinking driver. MADD’s Campaign to Eliminate Drunk Driving® calls for law enforcement support, ignition interlocks for all offenders and advanced vehicle technology. MADD has provided supportive services to nearly one million drunk and drugged driving victims and survivors at no charge through local victim advocates and the 24-Hour Victim Help Line 1-877-MADD-HELP. Visit http://www.madd.org or call 1-877-ASK-MADD.